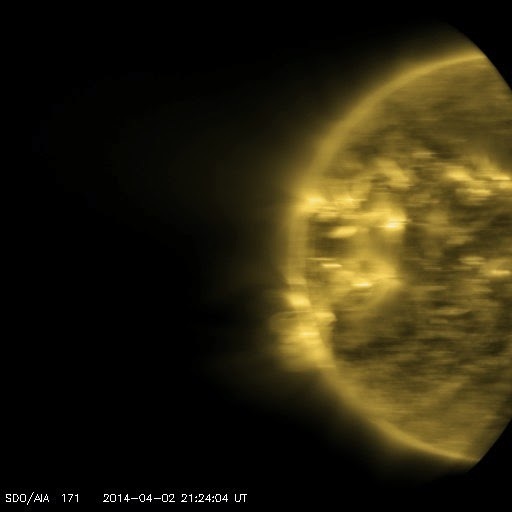 Today, 23-Apr-2014, SDO will perform two maneuvers. First up is the EVE Field of View, starting at 1315 UTC (9:15 am ET). Second is the HMI/AIA Flatfield, starting at 1630 UTC (12:30 pm ET). During these maneuvers the Sun will dance about in the SDO images. These maneuvers are used to keep the instruments well calibrated. One of the cool things about knowing astronomers is the clever things they do with cameras. Here is one example. William Livingston, a solar astronomer living in Tucson, AZ, has taken pictures of the geostationary satellite ring since about 2001. These satellites tend to be big, and stay in one place over the Earth. By taking a long exposure (here about 9 hours), the satellites are almost points of light while the stars are long trails. (A nine hour star trail would cover 135 degrees of the sky.) Here is an example from March 2014. You can see 40 satellites in the center of the picture, all but one labeled with their name. SDO orbits the Sun every 24 hours, but at an angle to where these satellites orbit. Because it does not hover over the same place on Earth, SDO moves up and down through the geostationary satellites every day. So SDO isn't a point of light, it is another trail moving across the star trails. To help you find it, SDO is labeled on the plot. It is the very faint trail moving downward from between DirecTV 11 and DirecTV 8 to the l in Solar. Dr. Livingston has been taking these pictures since 2001. I found a link about some of his first pictures. Another link describes the settings for digital cameras if you want to try to take pictures yourself. You'll need a dark sky and a steady mount! Thanks to Bill for sending me these pictures. Tonight, April 9, 2014, from 0519-1200 UTC (1:19 am - 8:00 am ET). SDO will execute the HMI Roll maneuver. The spacecraft will spin 360 degrees about the line to the Sun center. It stops along the way to collect a few images at each of the points. Usually the near-realtime images that are served from the SDO website are "de-rotated", but sometimes we get the watch the Sun spin around. This data is used to study how the instruments change while they are on orbit. The most important science that comes out is whether the Sun is round or bulges a little bit at the waist. So far, it appears that the Sun bulges less than we expect and that bulge does not change very much as sunspots come and go. The only way to check is to redo the measurements at different times in the solar cycle. This set of points will be made at the maximum of Solar Cycle 24. Yesterday, between 1730 and 2230 UTC (1:30 pm to 6:30 pm ET) SDO did the EVE cruciform maneuver. SDO nods back and forth and up and down. Here is an example of an AIA image taken while SDO was moving, blurred by that motion. These maneuvers allow the EVE science team to maintain the accuracy of their measurements. Accurate measurements allow them to study how much energy is released in late-phase flares and other solar events.